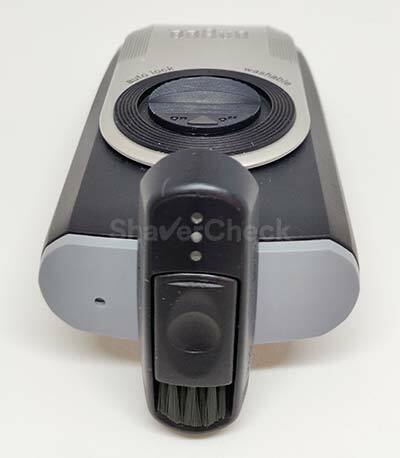 The M90 is probably the most popular model from Braun’s line of mobile shavers. The portability, clever design features, and the affordable price make it a very compelling option for shaving on the go. 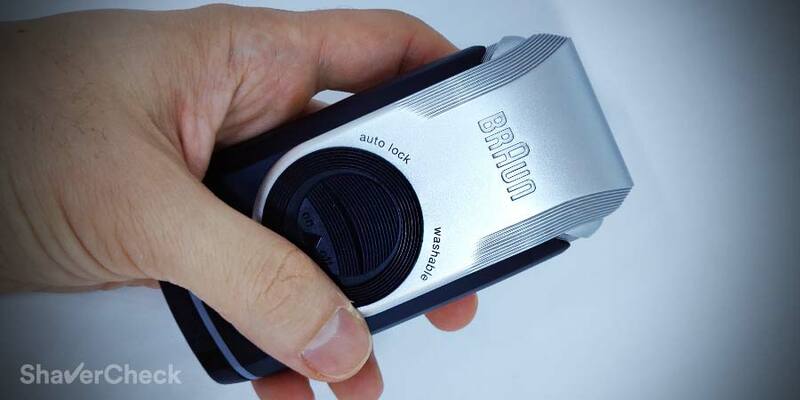 Let’s see how it performs in the real world in our Braun M90 review. Wrapup — Who should buy the Braun M90? The Braun M90 is a single foil electric shaver powered by two AA batteries. 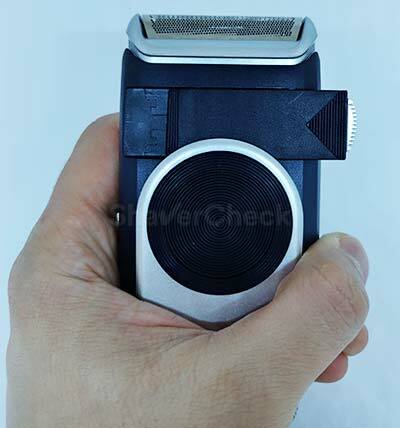 This is a suitable approach for a mobile shaver as there’s no need to carry a charging cord and AA batteries are cheap and readily available. In my opinion, a USB port would be ideal, but we’re yet to see them on mainstream electric shavers. Despite being waterproof for easy cleaning under running water, this razor is only suitable for dry shaving. The M90 also features a cleverly integrated protective cap, a pop-up trimmer and a cleaning brush. We’ll talk more about each of them in the next section. The Braun M90 mobile shaver is entirely made of plastic, with no rubberized surfaces. The matte finish does provide a decent amount of grip though. The color scheme features a dark blue for the body of the razor and light grey for the protective cap and the plastic frame of the foil. The build quality is very good for a razor in this price range and it’s probably my favorite part about the M90. It feels rock solid, the plastic doesn’t flex or make any cracking noises even when serious pressure is applied and everything looks and feels of high quality. The M90 exhibits some of the traits that made Braun’s industrial design from the Dieter Rams era world famous. It uses simple solutions that work brilliantly. 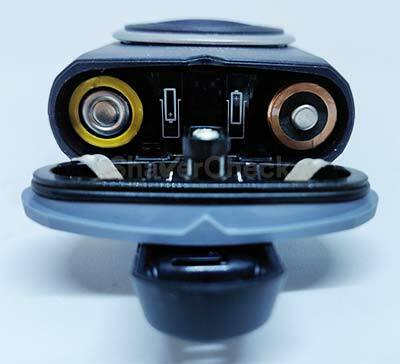 First, there’s the integrated rotating protective cap that also doubles as a travel lock. When it covers the foil, the ON/OFF switch is physically locked and can’t be operated. Turning the cap 180 degrees unlocks the switch while also extending the total length of the shaver, making it more comfortable to hold and operate. Braun practically fixed 3 problems (travel lock, protective cap, ergonomics) with only one clever design feature. This is what good design is all about. Another brilliant solution is the included cleaning brush that slides into the back of the shaver and it is securely locked in place. This apparently minor detail just makes things much easier for the user. The cleaning brush is a small item that’s easy to misplace or you simply forget to bring it along. Again, props to Braun for thinking about all the details. To access the battery compartment, you must turn the bottom cover 90 degrees counter-clockwise and pull. When opened, this hatch remains attached to the body of the shaver, so you can’t lose it and also has a rubber gasket around it to keep water from getting in. These are small details that ultimately make a big difference. The battery cover locks securely and everything lines up perfectly. Overall, I am very impressed with the build quality and the ergonomics of the M90. 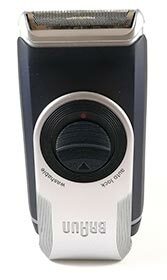 The M90 is powered by two regular AA batteries and they can be easily replaced with new ones. Depending on how you use the razor, a couple of quality alkaline AA batteries should provide one hour of shaving time. And that’s actually quite good. You can also use rechargeable batteries (with a separate, standalone charger) to reduce your running costs to a minimum. As I said at the beginning of this review, I find the solution of regular, replaceable AA batteries to be a decent one for a travel shaver. Since you don’t have to carry around a charging cord or wait quite a lot for a full charge, the Braun M90 is a more versatile and practical travel razor. 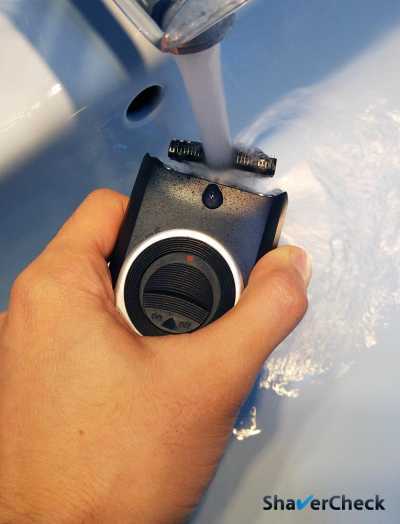 Being a basic and simple electric shaver, the M90 is extremely easy to clean. Moreover, the foil and cutter can be separated unlike on other Braun shavers that use cassettes. This makes the cleaning process extremely straightforward and easy. Removing the foil is done by gripping the frame from the sides and pulling gently forward. The foil should come off very easily and expose the cutter. You can tap the foil frame on the countertop to remove the hairs and use the included brush to clean the cutter. Do not use the brush on the foil as it can be easily damaged. 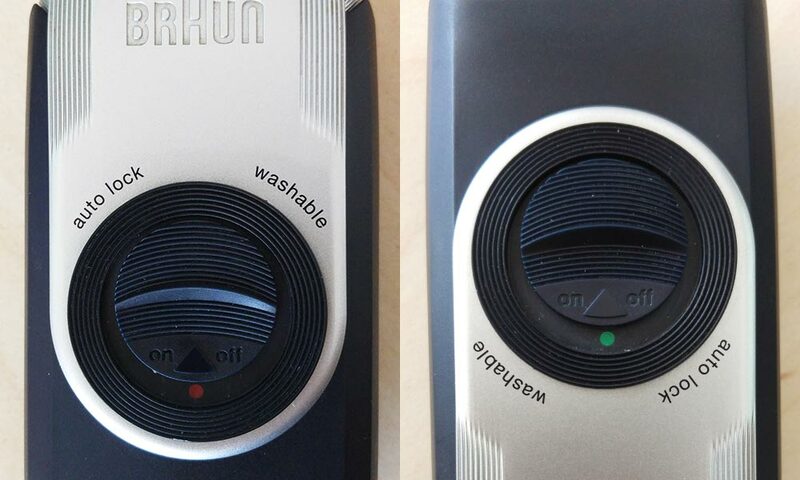 Being waterproof, the Braun M90 mobile shaver can also be rinsed with water. You can put a few drops of liquid soap on the foil for a more thorough cleaning and let it run for a few seconds. Rinse off all the soap from the foil and cutter with warm tap water, then pat dry with a cloth. Leave the foil unattached until everything is completely dry. Cleaning with water and soap removes pretty much all lubrication from the blades, so it’s highly recommended to use a drop of fine machine oil on the cutter and foil at least once a week. This will minimize the friction between the blades and the foil, reducing the heat and minimizing the wear. The shaving experience with the Braun M90 was a bit of a mixed bag. However, I will say right off the bat that for its intended purpose, it worked quite decently. When used for everyday shaving, the razor performed well. The closeness was adequate and dealing with short hairs wasn’t a problem. Being a basic razor, with just a single foil and a not so powerful motor, completing a shave was more time consuming than usual. Shaving every two days or more with the M90 unfortunately showed its limitations. Longer hairs were constantly being left behind, especially on my neck were they to tend to lie flat against the skin. Trying to go over them with more passes only resulted in discomfort and I ultimately had to use the popup trimmer to cut the stray hairs. Speaking of which, this is pretty much the only use for it. Its positioning, small size, and curved edge make it very difficult to use. But at least it’s there. Another gripe I have with the Braun M90 has to do with the comfort. More precisely, the post-shave comfort. While during the actual shave everything seemed just fine, right after completing a shave I always experienced some noticeable stinging and redness on my neck. This sensation faded pretty quickly once I applied an after-shave balm. Using a pre-shave did improve comfort, but it was still not a smooth experience. If you have sensitive skin (like I do), definitely keep this in mind. Overall, using the M90 for shaving a one day beard shouldn’t be a problem for most men. However, using it for longer, thicker hair will most likely result in an unpleasant shaving experience. Being a mobile shaver, the Braun M90 is intended to be used sparingly as a backup/complementary shaver. There’s not much to say about this as the retail package only includes the shaver and two AA batteries. To be fair though, the protective cap and the cleaning brush are basically part of the shaver and there’s also no need for a charging cord. The scarcity of the package is somewhat justified. Being a mobile shaver, I would have liked to find a travel case as well, but unfortunately there isn’t one. This is another area where things go a bit sour with the M90. There are two main problems with the replacement parts: durability and cost. The blades tend to go dull pretty quickly, especially if you have medium to thick facial hair. The foil doesn’t hold up much better either and there are multiple stories of users who have experienced this. More precisely, the foil can break after one year or even after a few months of use. Mine seems to be just fine, but others apparently weren’t as lucky. And then there’s the price issue. The foil and cutter together can cost more than a brand new M90 shaver. That’s unacceptable in my opinion and one of the main drawbacks of this razor. The parts can be bought online, even though you’d be better off buying a new shaver. The M90 is not a fully-fledged electric razor intended to be used as an everyday shaver. There are people who have successfully managed to use it as one, but I don’t see it happening for most men. I personally couldn’t use the M90 for anything more than a quick shave after one day of growth. If you have a very light beard and don’t suffer from sensitive skin, you could get away with using it as your main shaver. But in other situations, I just don’t see it happening because of the average performance and the sheer time it takes to complete a shave. The M90 was intended to be a complimentary razor to be used on the go. And for that alone, it does the job fine. You can keep in a drawer at your office, in your gym bag or in the glove box of your car and it can be very convenient for cleaning up a five o’clock shadow. I wouldn’t consider it a viable option for traveling if I was away for more than a couple of days. If that’s the case then I highly recommend sacrificing a bit more luggage space and bring along a proper shaver. Being inexpensive and very well built, the M90 is a great shaver to have as a backup solution. Just toss it in your bag and you’re all set. I was never fond of travel shavers as I always preferred the performance and comfort of a more advanced, full-fledged razor. While not as compact, it always seemed like a good compromise to me. A good alternative to the M90 would be the Panasonic ES3831K. There are a few reasons for this. 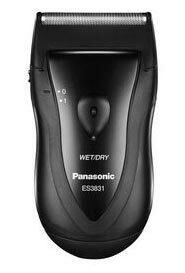 First of all, unlike the Braun, this Panasonic is a wet & dry shaver. Being able to use it with shaving cream is a big plus for me as I always get better results with wet shaving. Secondly, the Panasonic is slightly more compact. 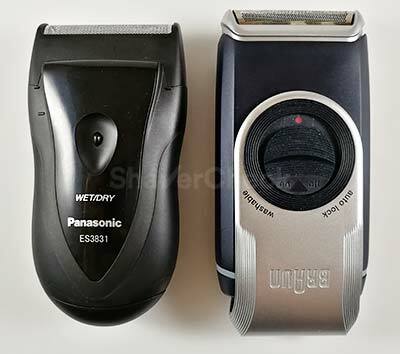 While the M90 is not by any means a large shaver, the ES3831K has the edge. Another bonus point for the Panasonic is the price. 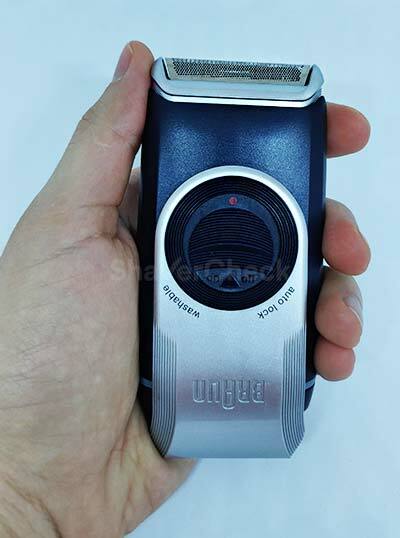 The shaver itself is significantly cheaper, costing 50% less than the M90 at the moment of writing this review. Also, the replacement foil and blade for the Panasonic are much cheaper than the ones for the M90 (even though they still cost more than a new shaver). Lastly, the Panasonic seems to be more frugal with the power consumption, being able to go for months with 2 AA batteries. For more details make sure to check out our review of the ES3831K.